We had a pin on the map to visit Louisville because one of our dear friends from college, Kimberly, lives there. 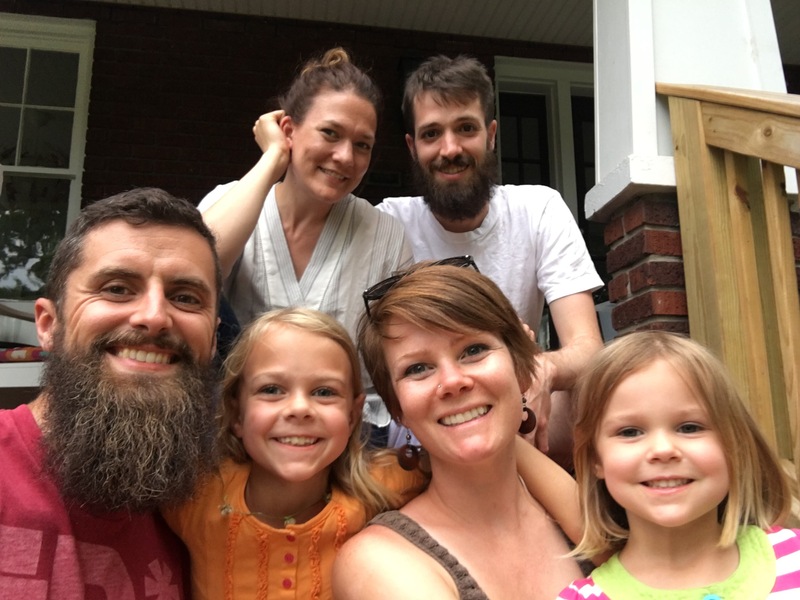 We had the joy of hosting her for dinner one evening in Stumbo, and then got to eat in Louisville one evening in her neighborhood at a local favorite hot dog and ice cream shop. So happy to get the chance to catch up with our dear friend, Kimberly, and meet Zack! 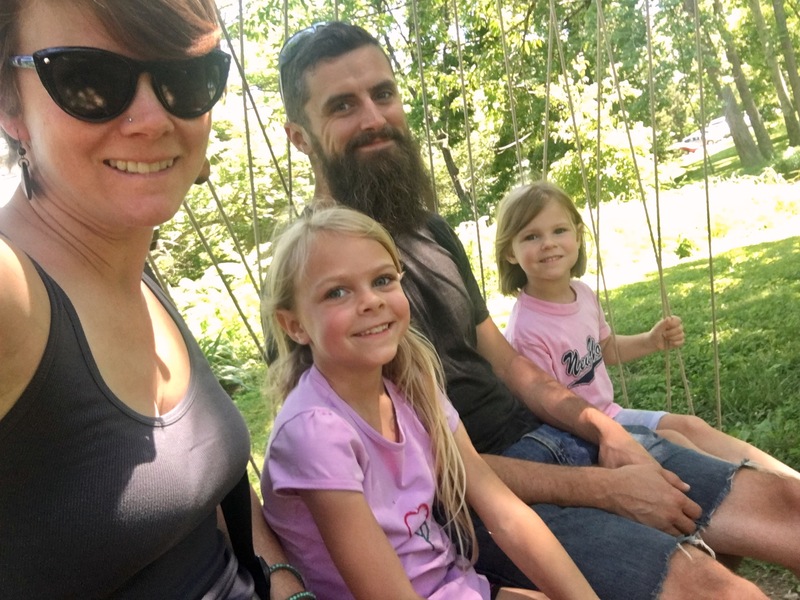 We thoroughly enjoyed our time catching up with Kimberly, which she carved out for us in her busy schedule getting ready to move to the East Coast. But we were also delighted by all of the other unexpected opportunities for fun and unique experiences in the Louisville area. 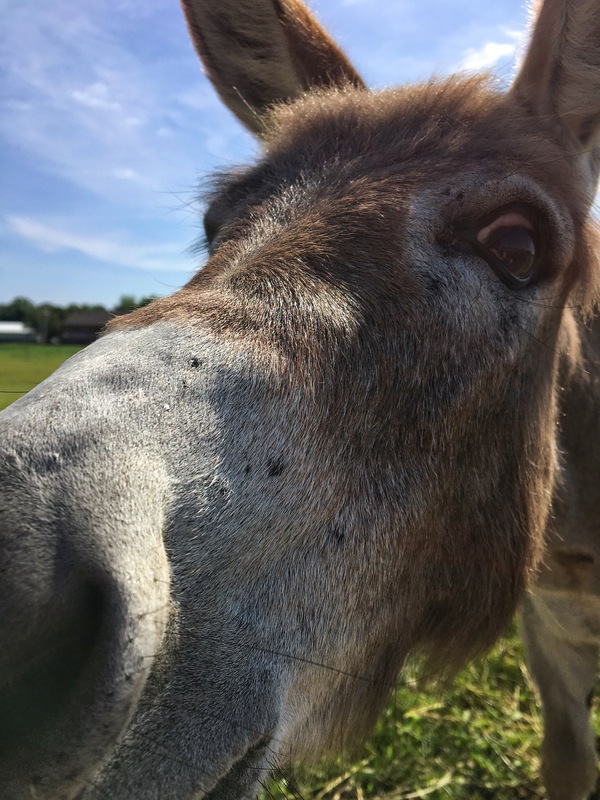 We had a small herd of donkeys as neighbors at our campground just south of Louisville. The girls tried their best to name them all, but sometimes telling them all apart was a challenge. It was striking how 2 very different worlds seem to collide in this area. Louisville, a very progressive city, plopped into a very conservative, southern state makes for an interesting recipe for crunchy meets hillbilly. It’s a breakfast of frozen Eggo waffles with organic, free-range chicken egg fried in ghee on top, served either with a Miller Lite or a La Croix – your choice. For example, in one day I visited two different “Flea Markets”. They were a mere 20 minutes from each other, but a world apart. 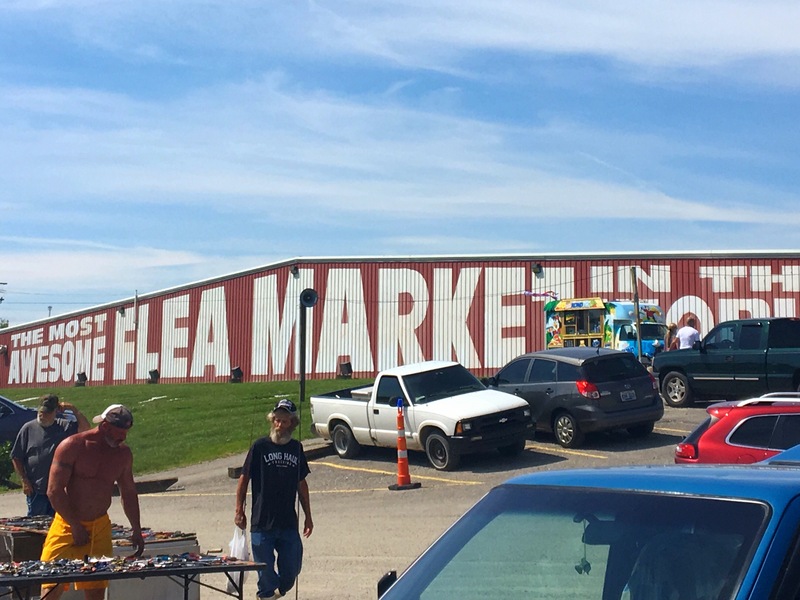 This “Most Awesome Flea Market in the World” was right next to our campground. It took up this entire giant building as well as a giant parking lot. It felt like miles of yard sale items that had been for sale for a decade, random packaged food items like chips and gum, tables of very new looking Nike shoes, and an occasion table of weapons, despite the fact that multiple signs around the premises warned that selling firearms was strictly prohibited. I held the girls hands tightly and moved quickly through the aisles. In the grass on the hillside the words “Thank You God” were spelled out in white gravel that could be seen from the nearby interstate. 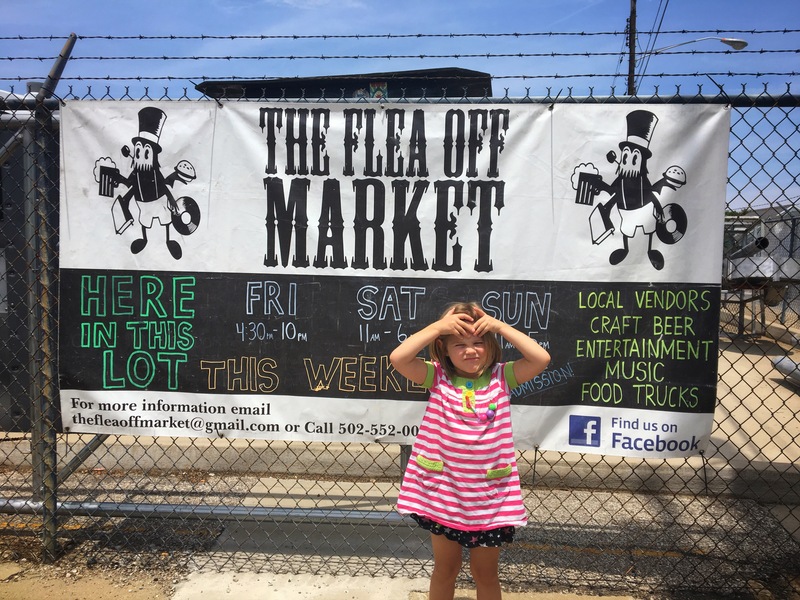 This flea market was quite different…vegan food trucks, hand made jewelry, ironic facial hair, and overpriced ironic t-shirts. There was also an art walk in a nearby neighborhood where we were encouraged to make our own art, swing on classic looking swings constructed for any random sidewalk passerby to enjoy, and eat locally-made popsicles. It was such a hot afternoon that even locally made popsicles and hipster furniture couldn’t help us. So we drove to a nearby playground for some refreshment. 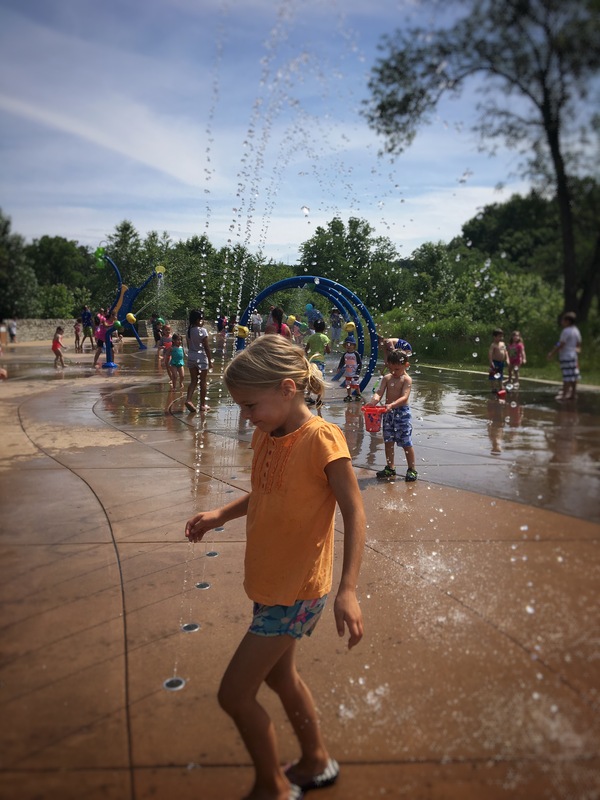 Finding this splash pad was a welcome treat on a hot afternoon! This expansive playground had a very fun dry playground, but the water feature was where all the action was happening on this hot day! 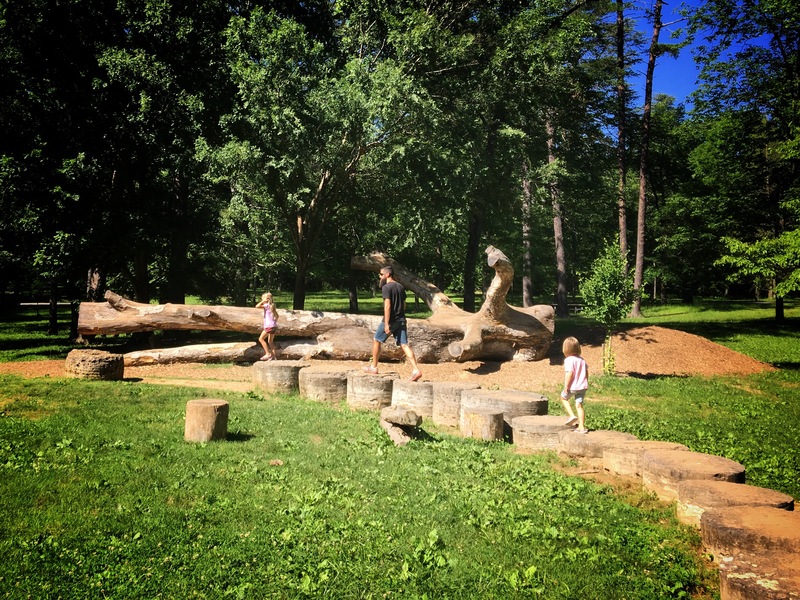 On another day we got to visit a fascinating place called the Bernheim Forest, based upon Kimberly’s recommendation. It is a large, privately owned natural area that is an arboretum and research forest. It was a lovely and magical place where nature met art, and green architecture met family educational opportunities. It was another one of those grand places that we just didn’t allow ourselves enough time to explore, but days might not have been long enough. It tugged at both the natural and the creative spirit with building blocks made out of smoothed branches, prolific gardens interspersed with man-made art, and spaces where we were encouraged to interact with nature in surprising ways. 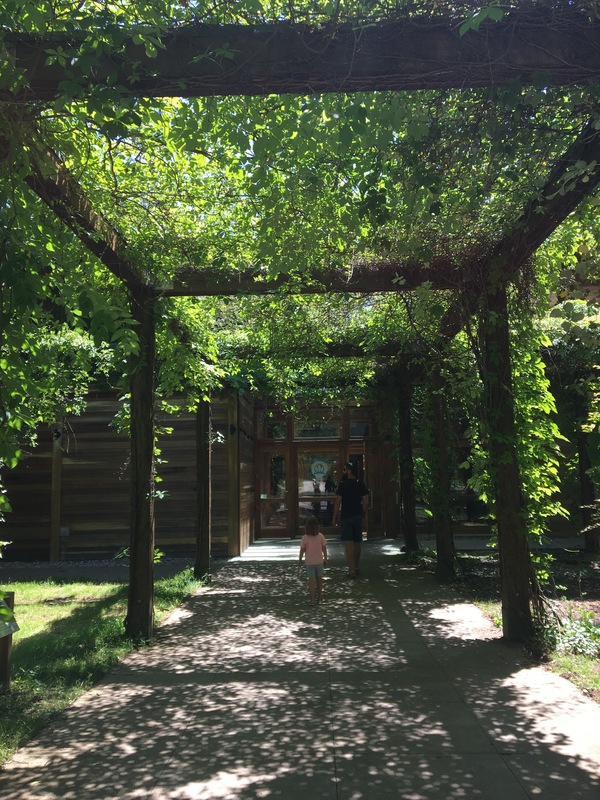 Entrance to the Visitors Center at the Bernheim Arboretum and Research Forest. 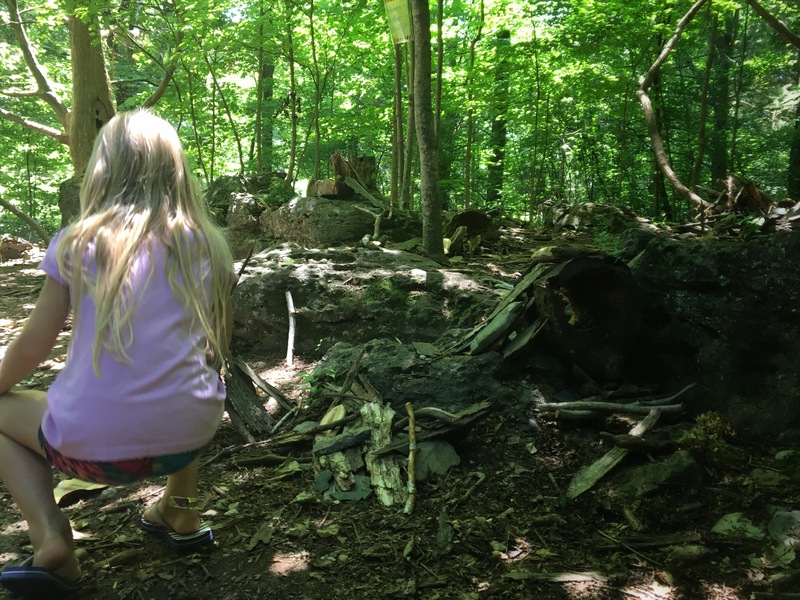 This section of forest was set aside for building fairy houses out of the natural materials laying around the forest floor. Between the trees there was a whole world of small houses and structures and cairns that people have set up over the previous months. The children’s play garden was an interesting playground concept. 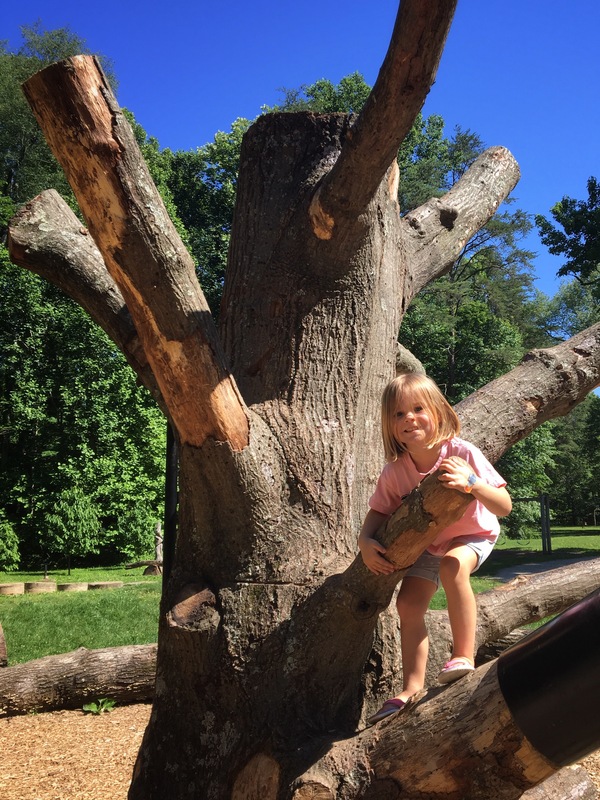 All the play areas were made from natural materials – downed trees with rough edges removed, boulders of various sizes arranged for climbing, or this series of large stumps but to different heights. It definitely encouraged imaginative play! Enjoying a beautiful wooden swing outside the Education Center at Bernheim. This was the “jungle gym” at the Children’s Play Garden. 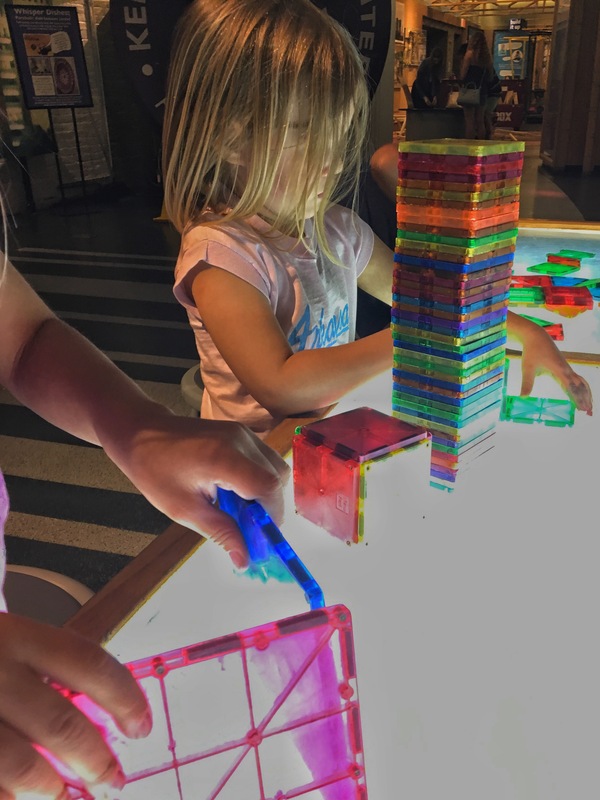 The girls and I also spent one afternoon at the Louisville Science Center. It was such a fun place, but it had so much to offer that we nearly ran from exhibit to exhibit to explore it all before closing time. If we had known how cool it was going to be, we would have planned to spend the entire day here. There may be only 1 thing worse than a boring museum…..an AWESOME museum that you haven’t given yourself enough time to enjoy! 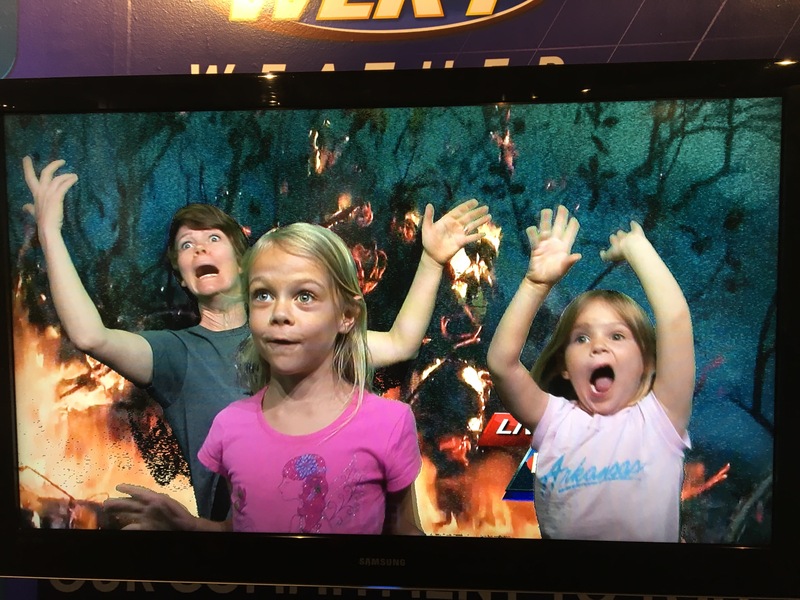 The Louisville Science was a BLAST, but we only had a few hours to rush through all it had to offer. 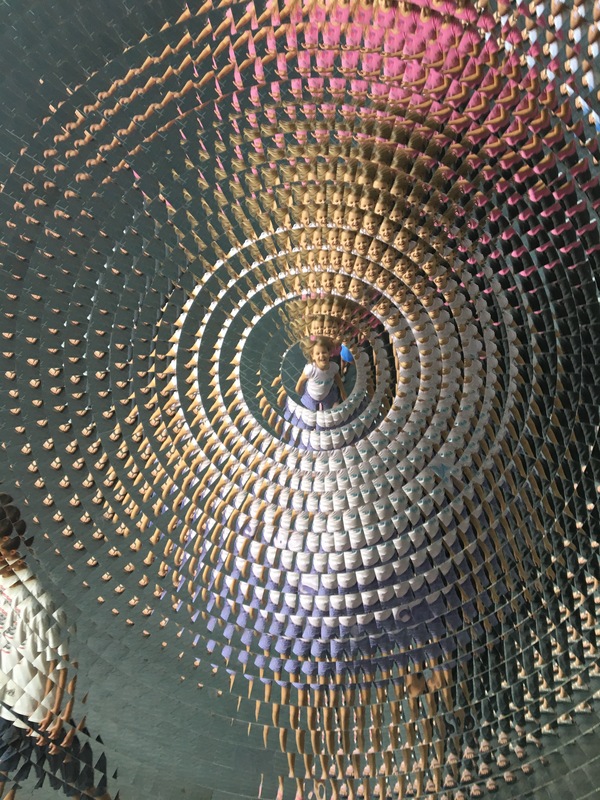 This super fun kaleidoscope mirror was outside on the sidewalk. 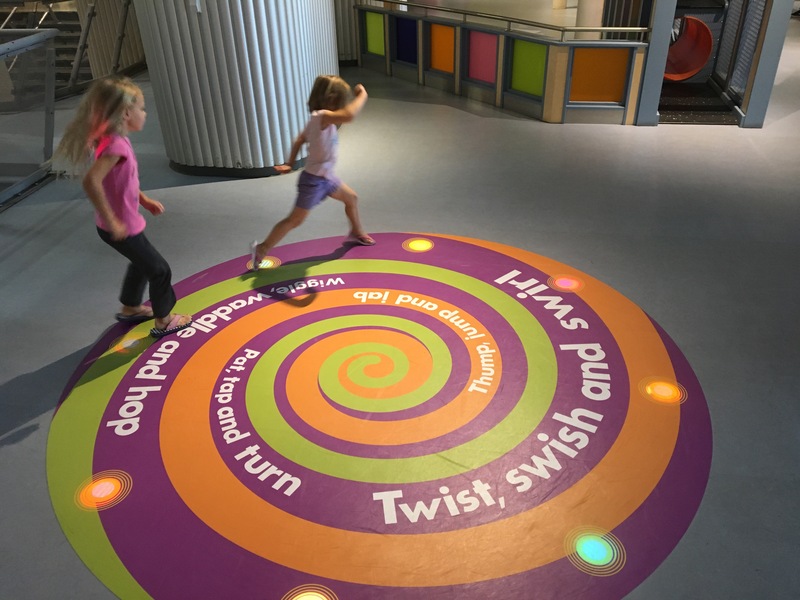 This fascinating make-your-own-maze exhibit was a series of waist-high L-shaped panels on wheels that you could roll around into different configurations. 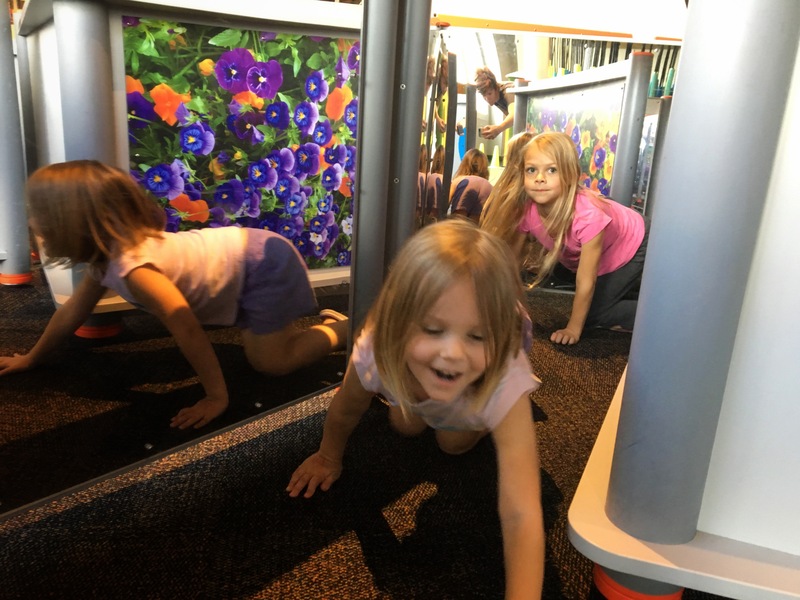 The girls preferred to explore each other’s maze combinations on all 4’s to add the challenge of not being able to peek over the tops. So fun! These lights in the floor each played a note, so as you hopped around the circle with friends it created an original bit of music. 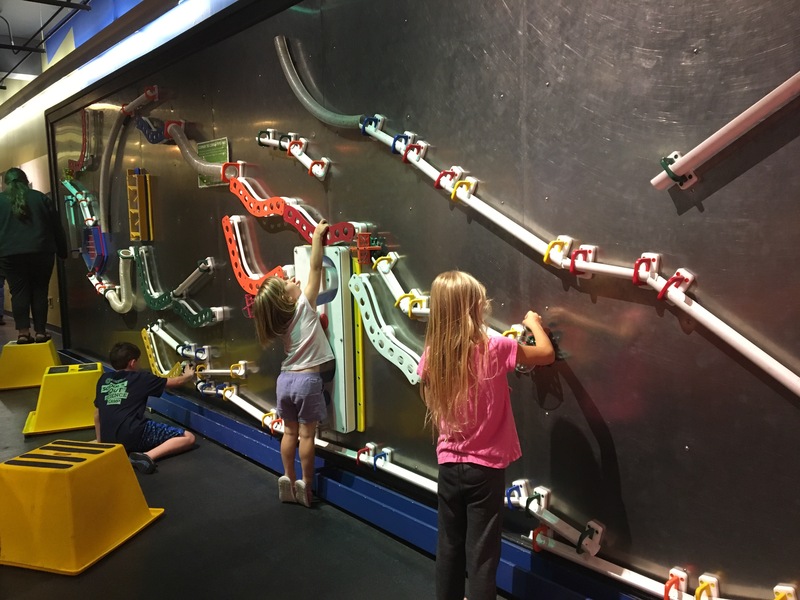 Another museum…another chance to make a small ball roll down a wall through a variety of manipulatives. Coral always loves building with these colorful shapes on light tables. They had some very fun building blocks that we had never used before. The weather forecast today is….not so good. 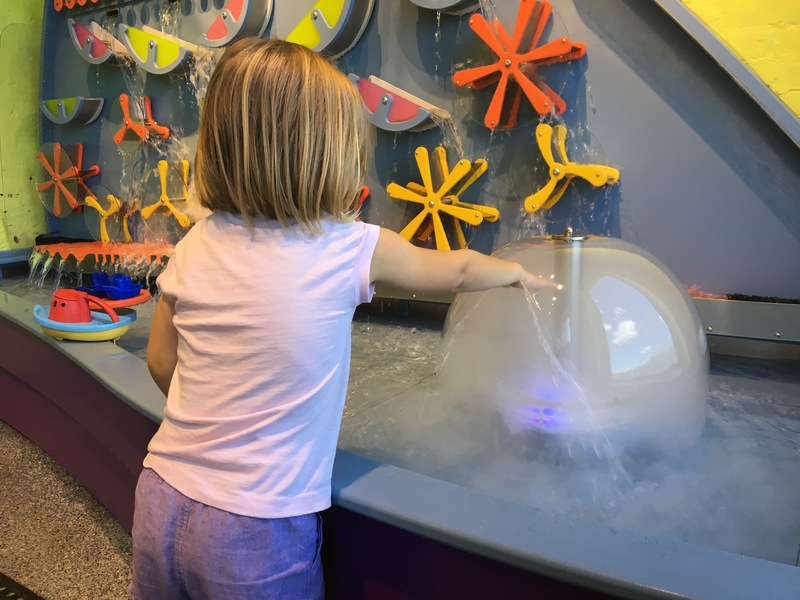 Fascinating water dome in the water play area. 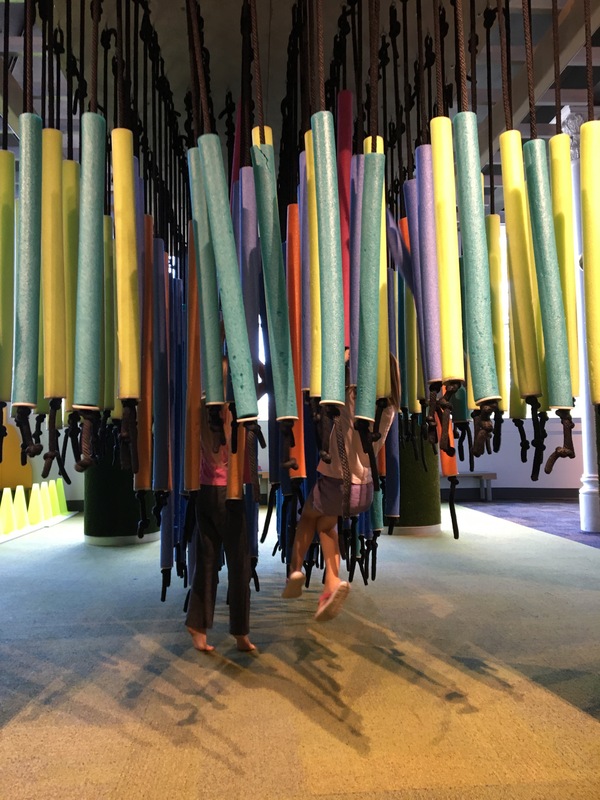 This forest of pool noodles suspended from the ceiling was possibly the girls’ favorite place to play at the museum. We began our visit, and at their insistence also ended our visit, at this spot. They were so disappointed when closing time meant it was time for us to leave. 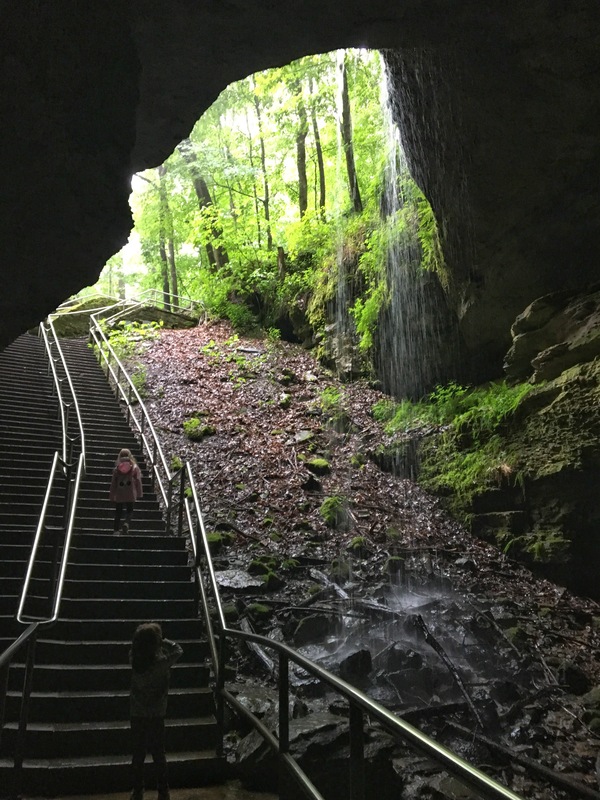 Another site that we were able to explore from this base camp was Mammoth Cave National Park, which is home to the longest known cave system in the world. 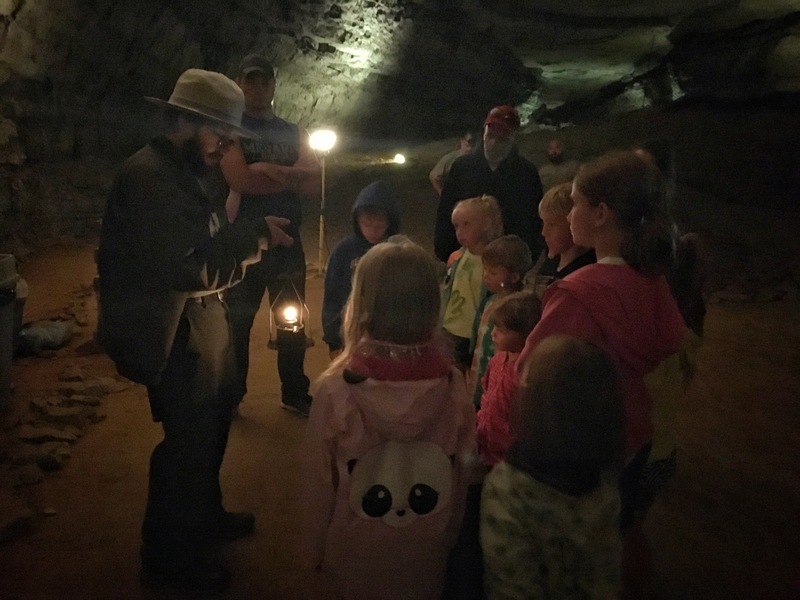 There are currently over 400 miles of cave mapped in and around the park, and the best guess is that they are not even half-way through discovering all of the tunnels that await. 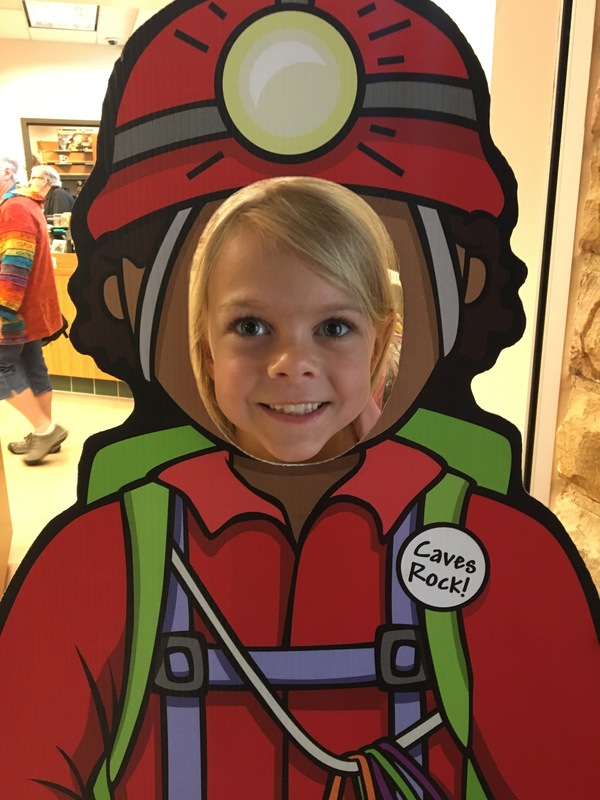 Instead of learning about counting tree rings and proper trail etiquette, this Jr Ranger book taught about cave formation and eyeless cave creatures. On our way out the natural entrance to Mammoth Cave. Inside the cave, this ranger taught us more about the white, eyeless fish, shrimp, and crayfish. It was nearly impossible to get good photos inside the cave, but this formation is known as “Frozen Niagara”. Pretty different from the Niagara we’d seen a couple of weeks earlier, but still worth the visit. 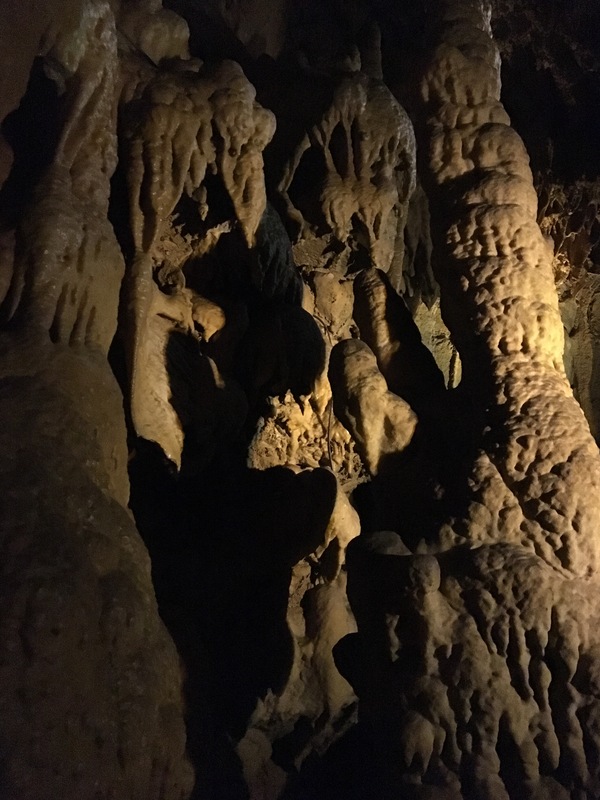 Fascinating rock formations inside Mammoth Cave. One of our tour guides told us that there hasn’t been any portion of the cave collapse since the 90’s. That was before she was born, so it seemed to her like ages ago. As for me, I would have preferred to hear the story AFTER we were out from under the actual ground. 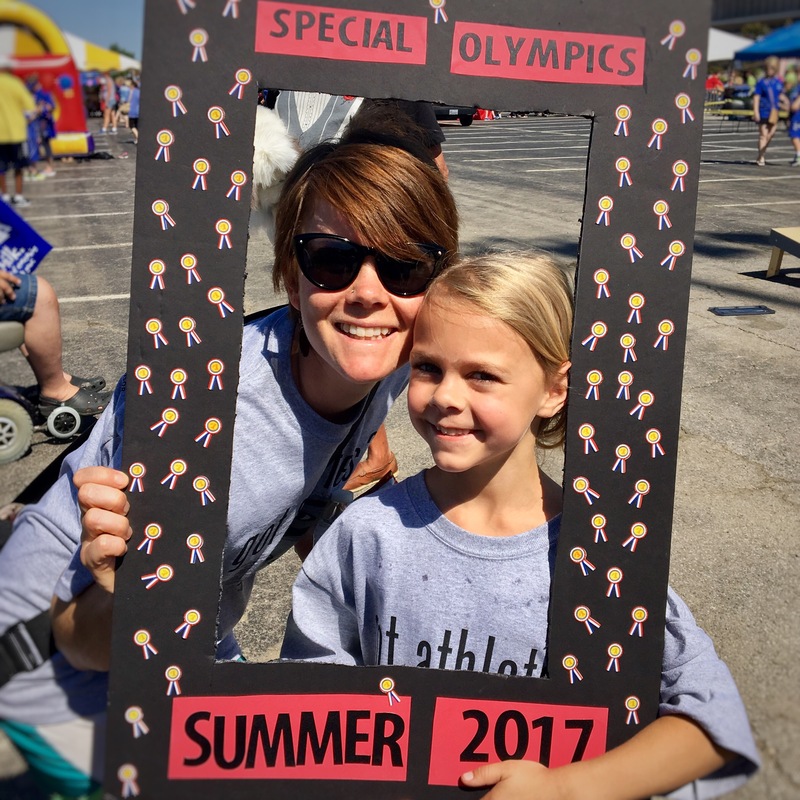 The first weekend of June is when many Special Olympics organizations all over the US hold their Summer Games, so I was lucky enough to connect with the Kentucky games during our time in Louisville. Sunny and I made the trek to Eastern Kentucky University in Richmond to help out for the day at their Olympic Town. I’ve had the great pleasure of being very involved with Special Olympics in Washington for over a decade, and if you know me well you know I’ve found this to be one my most meaningful pursuits in recent years. 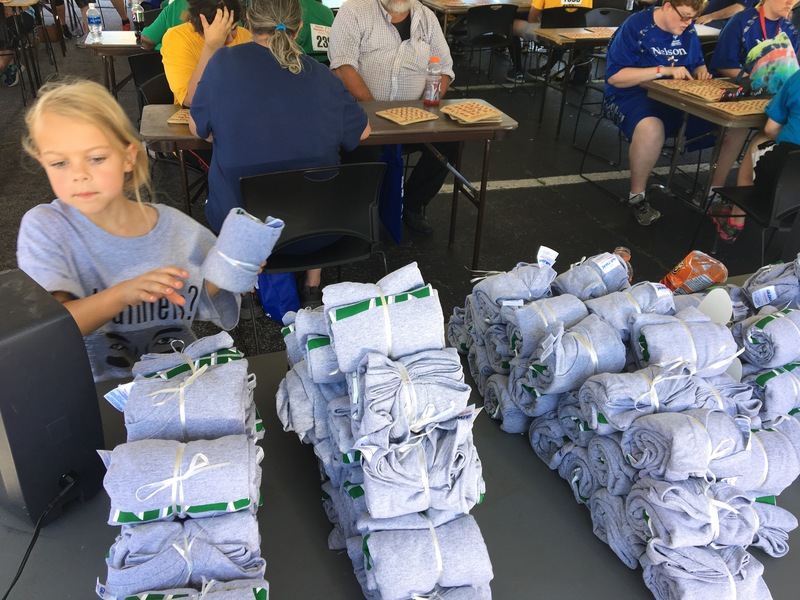 So it was a great joy to get to help out at the Kentucky games and see that this is a thriving organization that’s doing great things for people all over the country. The volunteers we assisted at the Bingo venue have been running this tent at the Olympic Town for over 20 years! 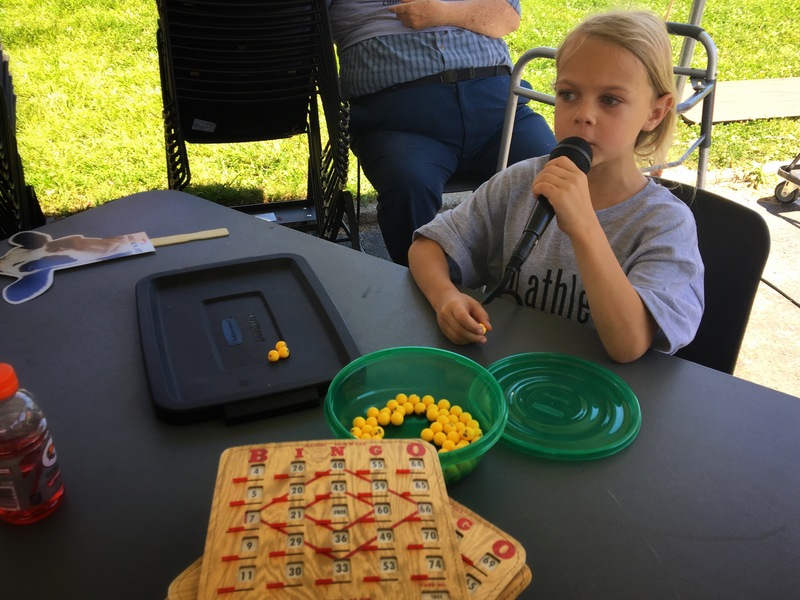 Sunny loved getting to call Bingo! 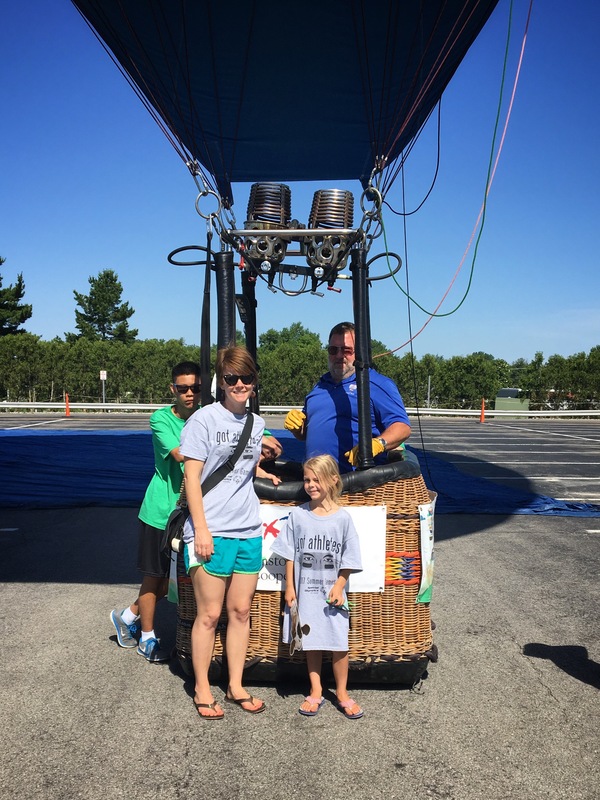 This is the closest I’ve ever come to going up in a hot air balloon! Unfortunately, they ran out of fuel right before we walked up, so they were no longer taking people up to hover above the parking lot. 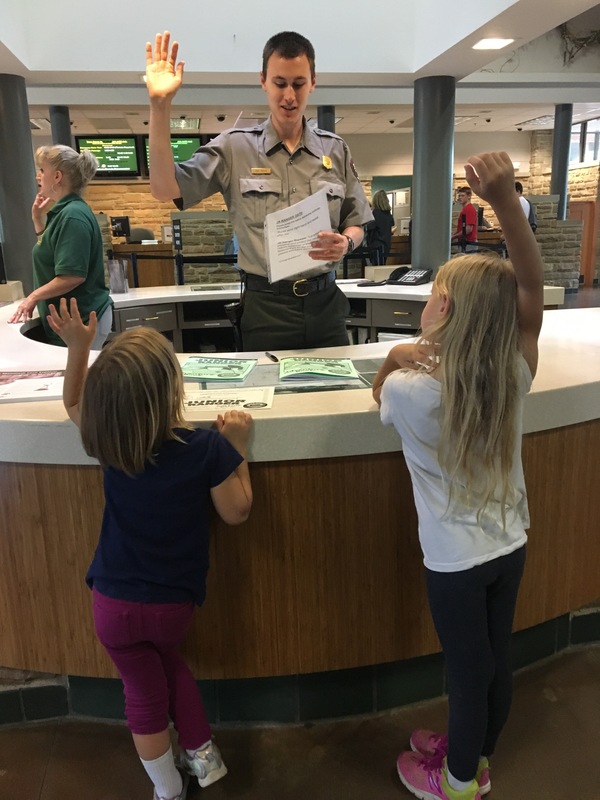 Finding volunteer opportunities on the road has been a challenge, so I was very happy to connect with this chance not only to volunteer, but to do so for an organization that I care so much about! 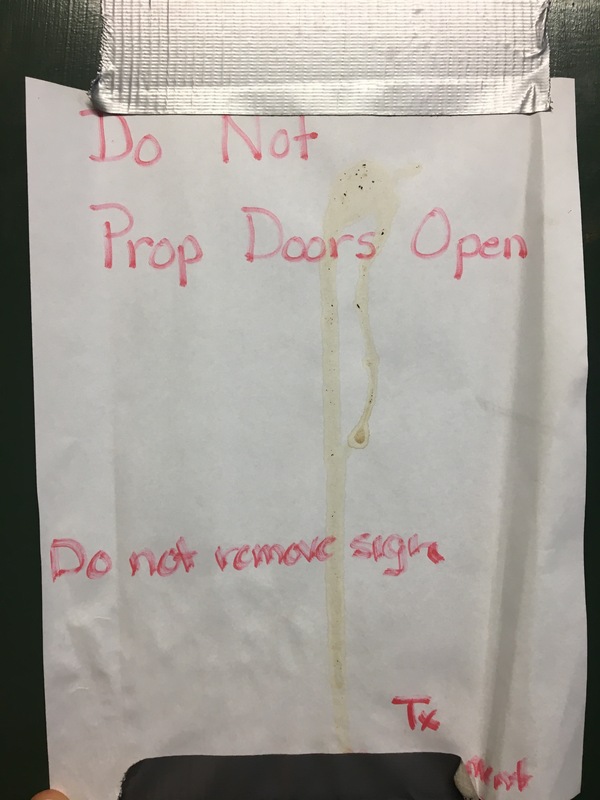 This one inside the laundry room with it’s “Do Not Remove Sign” was perhaps my favorite. 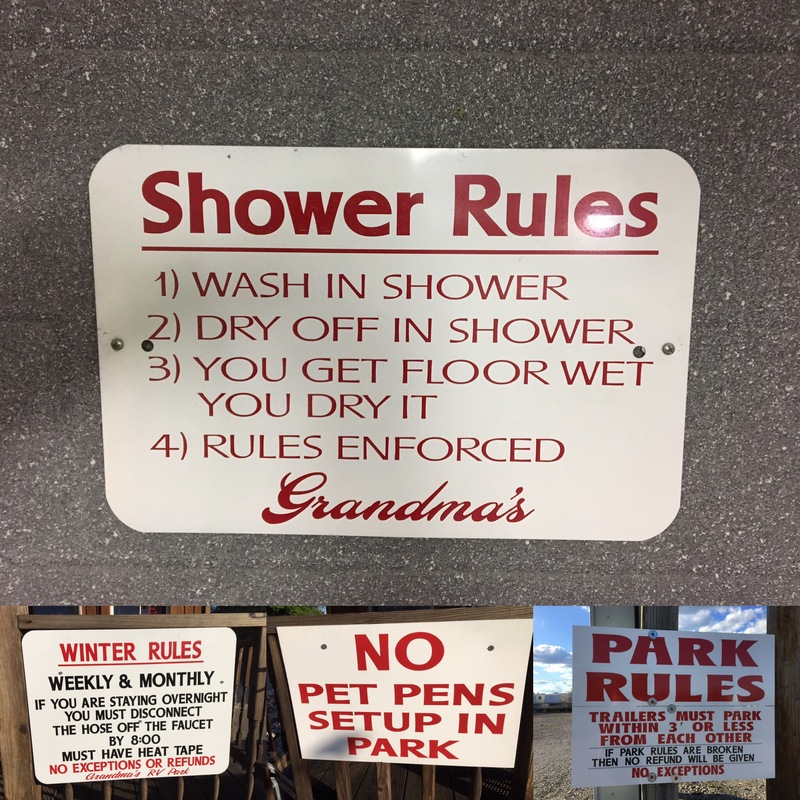 It was the root of a family joke…that the most important rule is FOLLOW THE RULES. 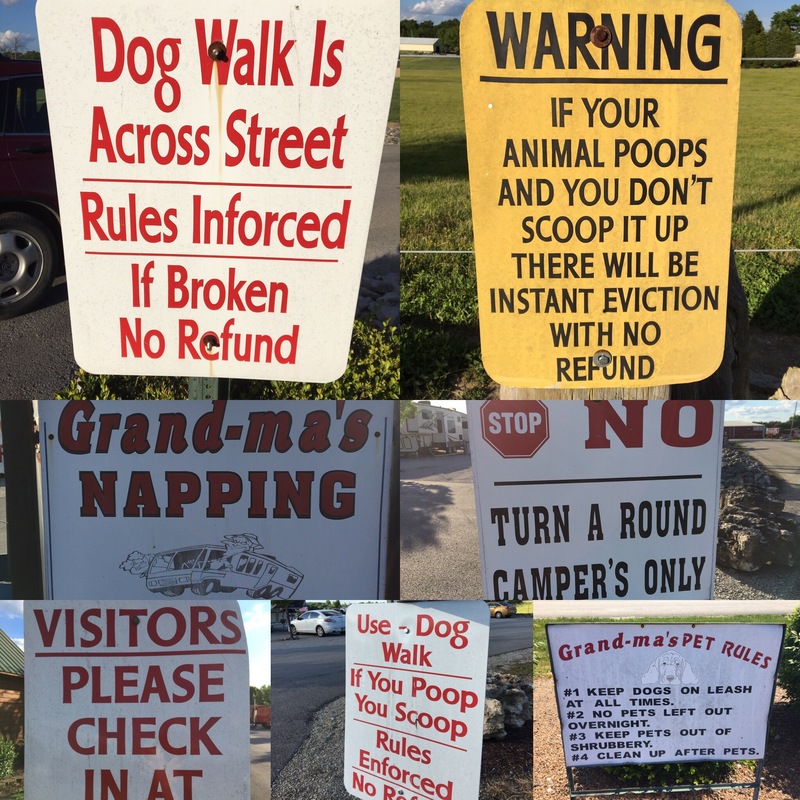 The campground we stayed at just south of the city of Louisville was an interesting one. It’s only about 10 years old, and has been constructed on part of a property that was once a large family farm. 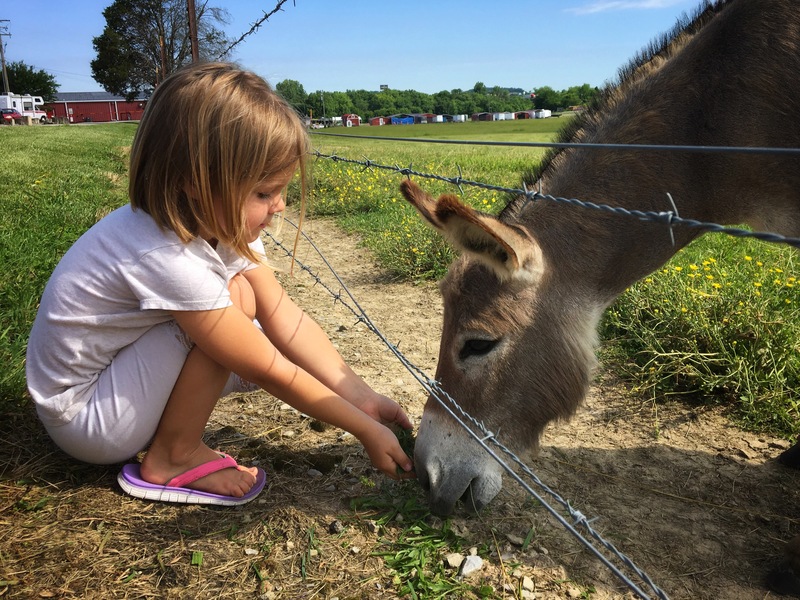 The children still own the property, but now it’s part farm, part flea market, part donkey haven, and part campground. I spoke for awhile one evening with one of the brothers working in the office. He told me about how they had to build up and flatten all the ground where they developed the campground because the ground was a bit of a sinkhole. 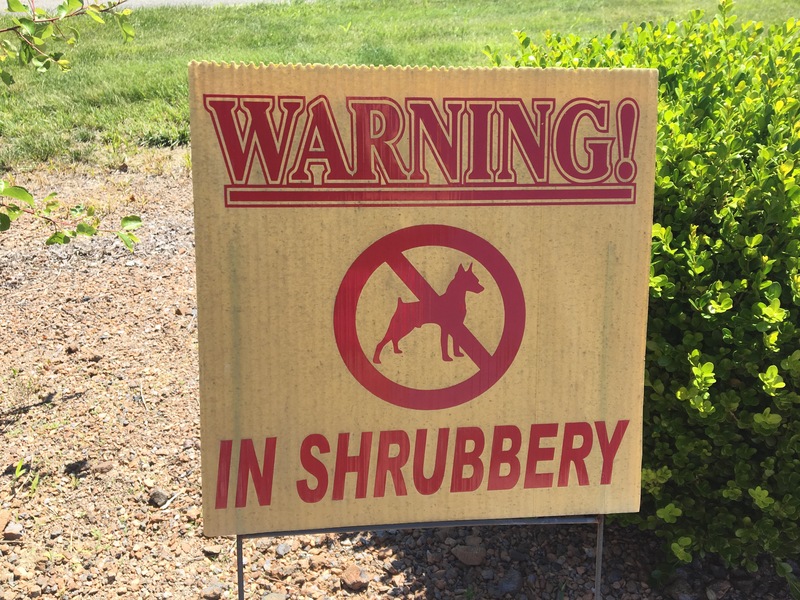 This information didn’t make me feel very secure after all that we’d learned about the underground structures that support (or should I say, often FAIL to support) the state of Kentucky. He told me about the time when he was 8 years old that a tornado hit his small cinderblock house, just a few hundred yards away from where we were standing. His parents and all 5 siblings were at home, and even though all that remained standing once it was all over was a stack of about 5 blocks in one corner, they all survived the event with only minor injuries. He was the most badly hurt, but a head wound that was assumed to have been caused by a cinder block flying through the air, and a compound fracture in one limb. I asked if the experience made him more or less afraid of twisters later in life, and his answer was that he had a healthy respect for them. It’s always been interesting to me that we hear about other parts of the world and their problems – whether its tornados and sink-holes, hurricanes, or violence – and we think, “Why do people choose to stay there? !” But I think the answer is because it’s “the devil you know”. It’s home, and so it feels like the safest place to be. 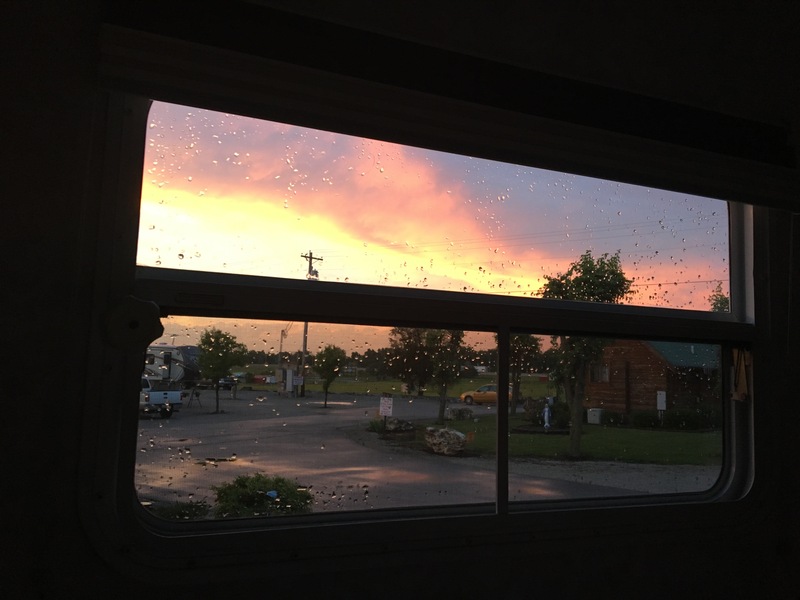 Lovely Kentucky skies after a storm.